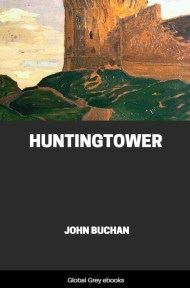 Huntingtower is the first of Buchans three Dickson McCunn books. It is set near Carrick in south-west Scotland around 1920. The hero is a 55-year-old grocer Dickson McCunn, who has sold his business and taken early retirement. As soon as he ventures out to explore the world, he is swept out of his bourgeois rut into bizarre and outlandish adventures, and forced to become a reluctant hero. 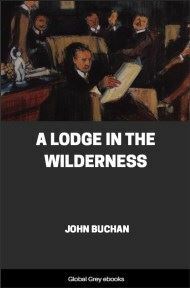 Mr. Dickson McCunn completed the polishing of his smooth cheeks with the towel, glanced appreciatively at their reflection in the looking–glass, and then permitted his eyes to stray out of the window. In the little garden lilacs were budding, and there was a gold line of daffodils beside the tiny greenhouse. Beyond the sooty wall a birch flaunted its new tassels, and the jackdaws were circling about the steeple of the Guthrie Memorial Kirk. A blackbird whistled from a thorn–bush, and Mr. McCunn was inspired to follow its example. He began a tolerable version of "Roy's Wife of Aldivalloch." He felt singularly light–hearted, and the immediate cause was his safety razor. A week ago he had bought the thing in a sudden fit of enterprise, and now he shaved in five minutes, where before he had taken twenty, and no longer confronted his fellows, at least one day in three, with a countenance ludicrously mottled by sticking–plaster. Calculation revealed to him the fact that in his fifty–five years, having begun to shave at eighteen, he had wasted three thousand three hundred and seventy hours—or one hundred and forty days—or between four and five months—by his neglect of this admirable invention. Now he felt that he had stolen a march on Time. He had fallen heir, thus late, to a fortune in unpurchasable leisure. He began to dress himself in the sombre clothes in which he had been accustomed for thirty–five years and more to go down to the shop in Mearns Street. And then a thought came to him which made him discard the grey–striped trousers, sit down on the edge of his bed, and muse. Since Saturday the shop was a thing of the past. On Saturday at half–past eleven, to the accompaniment of a glass of dubious sherry, he had completed the arrangements by which the provision shop in Mearns Street, which had borne so long the legend of D. McCunn, together with the branches in Crossmyloof and the Shaws, became the property of a company, yclept the United Supply Stores, Limited. He had received in payment cash, debentures and preference shares, and his lawyers and his own acumen had acclaimed the bargain. But all the week–end he had been a little sad. It was the end of so old a song, and he knew no other tune to sing. He was comfortably off, healthy, free from any particular cares in life, but free too from any particular duties. "Will I be going to turn into a useless old man?" he asked himself. But he had woke up this Monday to the sound of the blackbird, and the world, which had seemed rather empty twelve hours before, was now brisk and alluring. His prowess in quick shaving assured him of his youth. "I'm no' that dead old," he observed, as he sat on the edge of the bed, to his reflection in the big looking–glass. It was not an old face. The sandy hair was a little thin on the top and a little grey at the temples, the figure was perhaps a little too full for youthful elegance, and an athlete would have censured the neck as too fleshy for perfect health. But the cheeks were rosy, the skin clear, and the pale eyes singularly childlike. They were a little weak, those eyes, and had some difficulty in looking for long at the same object, so that Mr. McCunn did not stare people in the face, and had, in consequence, at one time in his career acquired a perfectly undeserved reputation for cunning. He shaved clean, and looked uncommonly like a wise, plump schoolboy. As he gazed at his simulacrum he stopped whistling "Roy's Wife" and let his countenance harden into a noble sternness. Then he laughed, and observed in the language of his youth that "There was life in the auld dowg yet." In that moment the soul of Mr. McCunn conceived the Great Plan. The first sign of it was that he swept all his business garments unceremoniously on to the floor. The next that he rootled at the bottom of a deep drawer and extracted a most disreputable tweed suit. 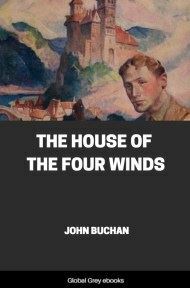 It had once been what I believe is called a Lovat mixture, but was now a nondescript sub–fusc, with bright patches of colour like moss on whinstone. He regarded it lovingly, for it had been for twenty years his holiday wear, emerging annually for a hallowed month to be stained with salt and bleached with sun. He put it on, and stood shrouded in an odour of camphor. A pair of thick nailed boots and a flannel shirt and collar completed the equipment of the sportsman. He had another long look at himself in the glass, and then descended whistling to breakfast. This time the tune was "Macgregor's Gathering," and the sound of it stirred the grimy lips of a man outside who was delivering coals—himself a Macgregor—to follow suit. Mr. McCunn was a very fountain of music that morning. Tibby, the aged maid, had his newspaper and letters waiting by his plate, and a dish of ham and eggs frizzling near the fire. He fell to ravenously but still musingly, and he had reached the stage of scones and jam before he glanced at his correspondence. There was a letter from his wife now holidaying at the Neuk Hydropathic. She reported that her health was improving, and that she had met various people who had known somebody who had known somebody else whom she had once known herself. 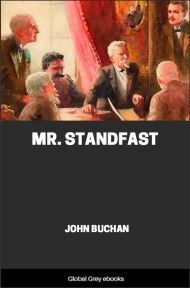 Mr. McCunn read the dutiful pages and smiled. "Mamma's enjoying herself fine," he observed to the teapot. He knew that for his wife the earthly paradise was a hydropathic, where she put on her afternoon dress and every jewel she possessed when she rose in the morning, ate large meals of which the novelty atoned for the nastiness, and collected an immense casual acquaintance with whom she discussed ailments, ministers, sudden deaths, and the intricate genealogies of her class. For his part he rancorously hated hydropathics, having once spent a black week under the roof of one in his wife's company.